In the Labyrinth, we had a saying: keep silent, keep still, keep safe. 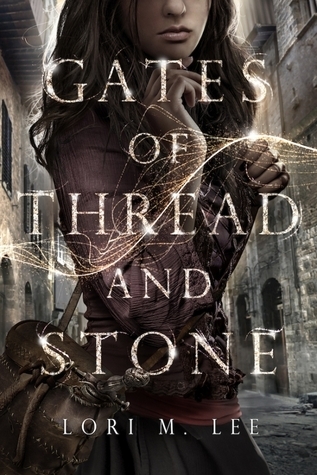 In a city of walls and secrets, where only one man is supposed to possess magic, seventeen-year-old Kai struggles to keep hidden her own secret—she can manipulate the threads of time. When Kai was eight, she was found by Reev on the riverbank, and her “brother” has taken care of her ever since. Kai doesn’t know where her ability comes from—or where she came from. All that matters is that she and Reev stay together, and maybe one day move out of the freight container they call home, away from the metal walls of the Labyrinth. Kai’s only friend is Avan, the shopkeeper’s son with the scandalous reputation that both frightens and intrigues her. Then Reev disappears. When keeping silent and safe means losing him forever, Kai vows to do whatever it takes to find him. She will leave the only home she’s ever known and risk getting caught up in a revolution centuries in the making. But to save Reev, Kai must unravel the threads of her past and face shocking truths about her brother, her friendship with Avan, and her unique power. This book was just plain amazing! Characters: I really did like all the characters but my fav would have to be the MC Kai. She doesnt let anything stop her from doing what needs to be done. Even when it comes to learning how to fight. She never backs down and jumps in with both feet. Even when someone she loves is lost to her forever she still doesnt fall apart. It made her a character to look up to one to strive to be like. And this for a ya book was wonderful! The side characters were pretty great to and I hope that one in particular (Mason) I hope we get a spin off book or something! He was awesome! And I could totally get into a book with him as the MC. The Story/World: this was another thing I really loved! The world building was wonderful although a few times in things that were describe I felt a little bit lost. But not enough to need to go back and sort things out. The story itself was wonderful, I liked how it centered around Kai trying to find her brother. It will be interesting to see where book two and three lead us since this one wraps up. FEELS~ This ending will so give you the feels! OMG the FEELS!!! I was heart broken during the last few pages just to have my heart being burned to a crisp. This is how the author made me feel with the ending of this! There is no love triangle but there is a hint of one. The ending doesn't necessarily end on a cliffhanger but it ends with you wanting to start book two ASAP!